This is almost a guernsey style man's sweater. 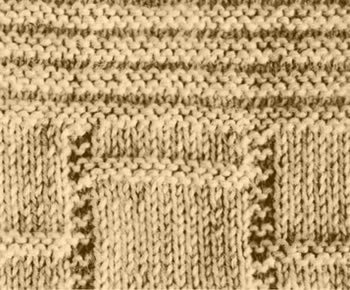 The "chequered pattern" is similar to the "Jacob's Ladder" in the guernsey tradition, although the raglan sleeve would not be traditional, and the double knitting yarn is a little heavier than the usual 5 ply. I particularly like the change to to the ridged pattern for the yoke, and the raglan sleeves. I guess if you were up to a challenge, you could thread all the stitches for the yoke sections on one circular needle, and knit in the round as one piece, avoiding any potential bulky seaming. 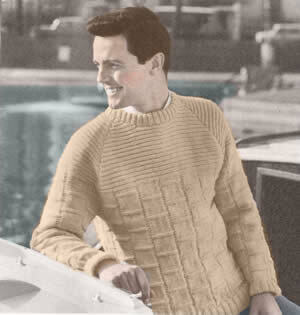 If I ever knit this, I may try that, but you do need to work it out first, as the decreasing for the sleeve sections is usually in a different sequence from the backs and fronts. "...typical "man appeal" style that will make it a winner..."
1st row (right side facing): purl. 2nd and 3rd rows: knit. 4th and 5th rows: purl. 6th and 7th rows: knit. 2nd row: p7(12), k2, * p12, k2; repeat from * to last 7(12)stitches, p7(10). 7th row: p7(10), * k16, p12; rep. from * to last 23(26)stitches, k16, p7(10). 8th row: k9(12), * p12, k16; rep. from * to last 21(24)stitches, p12, k9(12). 9th-14th rows: repeat 1st and 2nd rows 3 times. 15th row: k9(12), p12, k16; repeat from * to last 21(24)stitches, p12, k9(12). 16th row: p7(10), * k16, p12; rep. from * to last 23(26)stitches, k16, p7(10). These 16 rows form pattern. Continue straight in pattern until back measures 15 inches, measuring work down the centre on wrong side. With right side facing, shape raglans by casting off 5(5)stitches at the beginning of the next 2 rows, then decrease 1 stitch at each end of the next and every following 4th row until 90(96)stitches remain. Work 1 row in pattern. With right side facing, change to ridge pattern as given at the beginning, and work 2 rows straight, then continue decreasing 1 stitch at each end of the next and every following 4th row until 76(86)stitches remain. Work 3 rows straight. Continue in ridge pattern decreasing 1 stitch at each end of the next and every following alternate row until 36(38)stitches remain. Work 1 row in pattern and leave stitches on a spare needle. Work exactly as for the back until 54(56)stitches remain in raglan. Work 1 row in pattern. Next row: k2tog, pattern 15(15), turn, and leave remaining stitches on a spare needle. Next row: work in pattern. Continue shaping raglan on next and every alternate row as before and at the same time shape neck by decreasing 1 stitch at the neck edge on the next and every following 3rd row until 2 stitches remain; k2tog and fasten off. With right side facing, slip centre 20(22)stitches on a spare needle, rejoin wool to remaining stitches, and pattern to the last 2 stitches; k2tog. Finish to correspond with first side. Change to No 8 needles and work in pattern. 2nd row: p7, k2, * p12, k2; repeat from * to last 7 stitches, p7. Continue in pattern shaping sides by increasing 1 stitch at each end of the 5th and every following 6th row until there are 86(86)stitches. Work straight until sleeve seam measures about 19½ inches, ending with same pattern row as you did when you started the raglan on the back. With right side facing, shape raglan top by casting off 4(4)stitches at the begining of the next 2 rows, then decrease 1 stitch at each end of the next and every following 4th row until 64(64) stitches remain. With right side facing, change to ridge pattern as for back and work 2 rows straight, then continue decreasing 1 stitch at each end of the next and every following 4th row until 50(50) stitches remain. Now decrease 1 stitch at each end of the next and every following alternate row until 10(10) stitches remain. Work 1 row in pattern, and leave stitches on a spare needle. Join raglan seams matching patterns carefully. Work in rounds of k2, p2 rib for 2½ ins. Cast off loosely in rib using a bigger needle. Press parts lightly on wrong side under a damp cloth. Fold neckband in half to wrong side and slip-hem in position. Pair each No 8 (4mm), and No 10 (3¼mm), plus a set of four No 10 (3¼mm)needles, pointed both ends for neck-band. 22sts and 30 rows to 4 ins using No 8 needles over stocking stitch. actual size seems to be 41/(43)inches. Length from top of shoulders, 26/(26) inches; sleeve seam, 19½(19½)ins. Instructions for larger size given in brackets (bold blue). Where one set of figures is given this applies to both sizes. The tension and needle size indicate that any standard UK double knitting would work; in the US this yarn weight is probably considered a light worsted. It's worth checking your tension as, even in the UK, the term double knitting covers a multitude of subtle variations in yarn thickness.